We did not come up with this on our own. Dr. Woodie Flowers, FIRST National Advisor and Pappalardo Professor Emeritus of Mechanical Engineering, Massachusetts Institute of Technology, coined the term "Gracious Professionalism™." 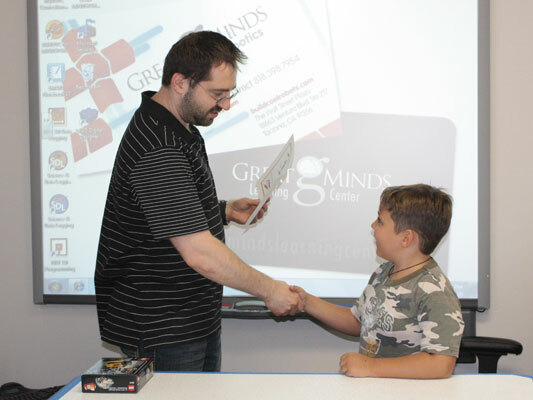 Gracious Professionalism is built-in to every facet of competition and learning at Great Minds Robotics. It's a way of behaving that emphasizes the value of others, encourages high-quality work, and respects individuals and their communities. We teach that fierce competition and mutual gain are not separate notions. Your sons and daughters will learn and compete like crazy, but treat one another with kindness and respect in the process. No one is to treat anyone else like a loser. Gracious professionals neither talk tough nor resort to phony compliments. They converse with "let's get this done" attitudes. Knowledge, competition, and empathy are comfortably blended and the result is that your kids will act more like adults every day. In the long run, Gracious Professionalism is part of pursuing a meaningful life. Give your child the gift of joy and satisfaction that comes from winning based on maximum effort and unparalleled integrity. Enroll them in Great Minds Robotics today.